Pro-lifers often get criticized for calling preborn children “babies.” Of course, we’re not the only ones who do this; when was the last time you heard a pregnant woman say she could feel her “fetus kicking”? Still, we’re told it just isn’t accepted within the medical community. Well, someone should explain that to Dr. Savita Ginde, because she has no problem with referring to fetuses as babies. Even after she’s killed them. Dr. Ginde is the vice president and medical director for Planned Parenthood of the Rocky Mountains. She also performs abortions. 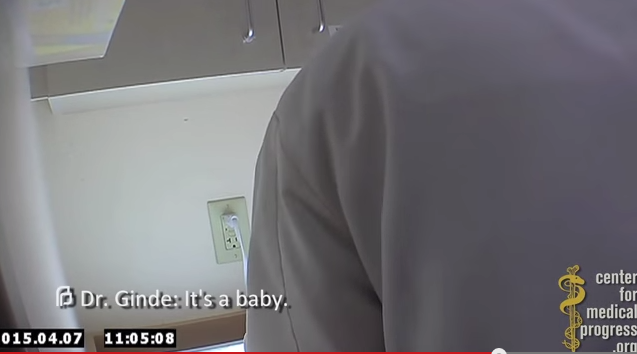 In the Center for Medical Progress’ latest video, Ginde is shown speaking to people she thinks are from a company that purchases fetal body parts. Changing how an abortion is performed so as to facilitate organ harvesting is also illegal. Apparently that’s not a problem for Ginde, though, because she makes clear that she doesn’t object to doing it. At nine minutes and three seconds, Ginde herself casually remarks that “it’s a baby” when showing a corpse to a prospective buyer. But while the doctor obviously recognizes that she kills babies inside their mothers, that might not be the only place those killings are committed. One of the procedures that Ginde employs is called D&E–dilation & evacuation. Typically used in the second trimester, it involves pulling the baby apart with a set of forceps. Of course, dilation carries a risk that the child will come out early, and at two minutes and three seconds, Ginde admits that this does occur from time to time. She doesn’t say if the children are born alive or what happens if they are. However, we do know what others in the abortion industry have done. In 2013, Dr. Kermit Gosnell was convicted of murdering newborns in his Philadelphia clinic. Undercover work by Live Action suggests that his behavior wasn’t unique. In 2012, pregnant volunteers took hidden cameras to a number of abortion facilities. During each visit, the woman asked what happens when a baby is inadvertently delivered alive. In each case, she was told the child doesn’t stay that way. The possibility of newborns being murdered is revolting. The idea that it could be happening with federal help is incomprehensible. Every year, Planned Parenthood receives over half a billion dollars in taxpayer funding. You can sign Live Action’s petition asking Congress to end that habit. You should also contact Colorado’s Attorney General, Cynthia Coffman, and tell her you want an investigation into the possible killing of infants at Planned Parenthood of the Rocky Mountains, as well as the other crimes that Dr. Ginde describes. Because while Planned Parenthood might not have a problem with that sort of thing, the rest of us feel differently.